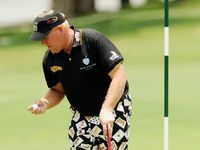 SUNSHINE Coast golf fans have witnessed another John Daly meltdown after the loudly dressed golfer couldn't find form with his putter. 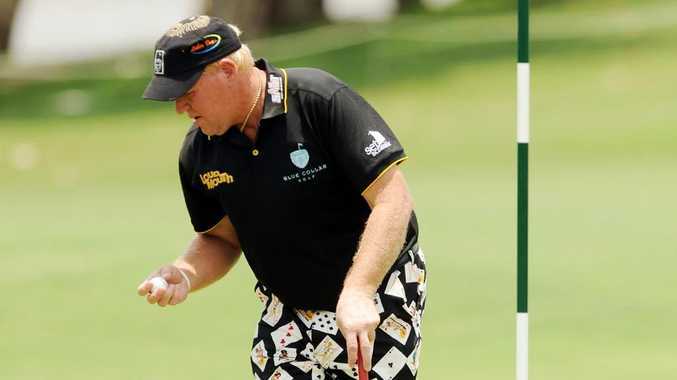 The wild one of golf - who famously hurled his putter into a lake beside the 18th green of the Hyatt Regency Coolum course in 2002 - crashed out of the second round of the Australian PGA after a shocking 83. A triple bogey, three doubles and three bogeys saw the American with an 11-over par to bomb out of the event. Daly - who has had huge crowds following him around the Coast course - was one of the drawcards of the PGA - and has been paid handsomely to appear. 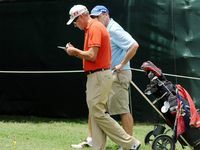 Daly was playing along defending champion Robert Allenby and leading Chinese player Wenchong Liang. Throughout the day he appeared disinterested, rushing his shots and his putts as any hope of making the final cut slipped away. Tournament promoter Tony Roosenberg, a longtime Daly friend and suppoter, sprung to the American's defence, denying he and Allenby had words. "That's definitely not the case," Roosenberg told AAP. "He was very disappointed but there was absolutely no words between the two players. "John has been playing really well but he can't get the putter going. "He's been very frustrated and today was a bit much. "That's the way it goes with John. It must have all gone wrong. He missed the cut (at last week's Australian Open) in Sydney and he had 83 today, which is disappointing. "He's striking the ball well which makes it all that much harder for him." Who will win the Australian PGA Championship? This poll ended on 13 December 2010.